Abuja, Nigeria. November 25th, 2014 – Latest Telecommunications Special Edition poll results released by NOIPolls Limited have revealed that a higher proportion of Nigerians use 2 phone lines either registered under one network provider or under two different ones. This trend has been consistent from 2012 to 2014; however, a 5-point reduction in the proportion of Nigerians in this category was seen from 2012 to 2013 and 3-points increase in 2014. An assessment of the mobile network used by Nigerians placed MTN as the highest used network in the past two years (2012-2013) and even in the present times; although subscription to this provider has consistently declined within this period. According to the MTN group, this decline has been mainly due to 'regulatory restrictions' imposed by the telecoms watchdog and growing spate of unrest by Boko Haram especially in the Northern part of Nigeria. Other Networks used by Nigerians in the order of higher subscribers include; Airtel (45%), Etisalat(33%), Glo (28%) and Visafone (1%). In line with this, the proportion of Airtel subscribers which seemed steady from 2012 to 2013 at (39%), picked up by 6-points in 2014 (45%), thus, making it the only network that has seen a considerable growth in the proportion of its users. This increase may have been driven by the discovery of the cheaper tariffs offered by this network compared with other networks. More findings on the usage of phone lines revealed a higher proportion of subscribers (76%)use MTN as their main line; this could have been as a result of a first mover advantage earned by this operator. In addition, 15% of mobile network subscribers indicated Airtel as their main line, 5% indicated Glo, while 4% of subscribers use Etisalat as their main line. An assessment of the services provided by network providers revealed that a higher proportion(64%) of mobile phone users across all networks are getting value for money from their main network provider through the ‘quality of network services’ (27%), ‘bonus offers’ (25%) and‘cheaper tariff’ (23%) among others. Furthermore, MTN ranks highest for providing best services in Nigeria in 2014, followed by Airtel and Etisalat (68%, 17% and 11% respectively)and to further improve the quality of services of Network providers, subscribers have suggested the ‘reduction of tariff’ (30%) as a measure for improving the quality of telecommunication services while capitalizing on ‘wider network coverage’ (22%) and‘improved network services’ (22%). These were some of the key findings from theTelecommunications snap poll conducted in the week of November 17th 2014. At the dawn of the 21st century, mobile network providers were granted licenses to operate in Nigeria, hence, the introduction of the Global System for Mobile Communication (GSM) which subsequently changed the frontage of telecommunications in Nigeria. In the present times, figures obtained from Nigerian Communications Commission (NCC), reveals that the teledensity of the country’s telecommunications industry increased to 96.08 per cent in September, from the 90.78 per cent in March 2014 just as active lines in the nation’s telecommunications industry increased to 134,507,329 in September 2014. Nigeria’s teledensity is currently calculated by NCC on a population of 140 million people. Given this major breakthrough in the telecommunications industry, and with the competitive nature of the industry due to the advent of different players, ‘Quality of Service’ has been the major criteria for measuring the satisfaction of mobile network subscribers. In line with Section 89 of the Nigerian Communications Act 2003 which mandates the Commission to monitor all significant matters relating to the performance of all licensed telecoms service providers, the Commission placed a ban on the sales of new SIM cards in March 2014 and on promotions or bonus offers on some mobile networks operators recently, following the failure of these operators to meet the various Quality of Service (QoS) Key Performance Indicators (KPIs). Recommendation to improve the quality of services. Respondents to the poll were asked ten specific questions; only 6 of these questions are discussed in this release. With the aim of assessing the usage of mobile phone lines in Nigeria, respondents were asked: How many phone lines do you currently use? 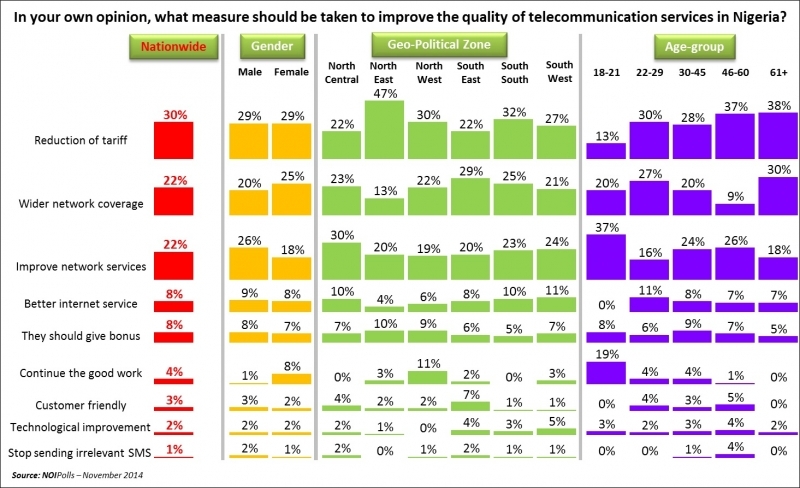 Findings from the current poll highlights that a higher proportion of Nigerians use 2 phone lines. These lines could either be registered under one network provider or under two different ones. The use of 2 or more lines could probably be driven by the need to overcome certain issues associated with mobile network which could range from accessibility to cost. 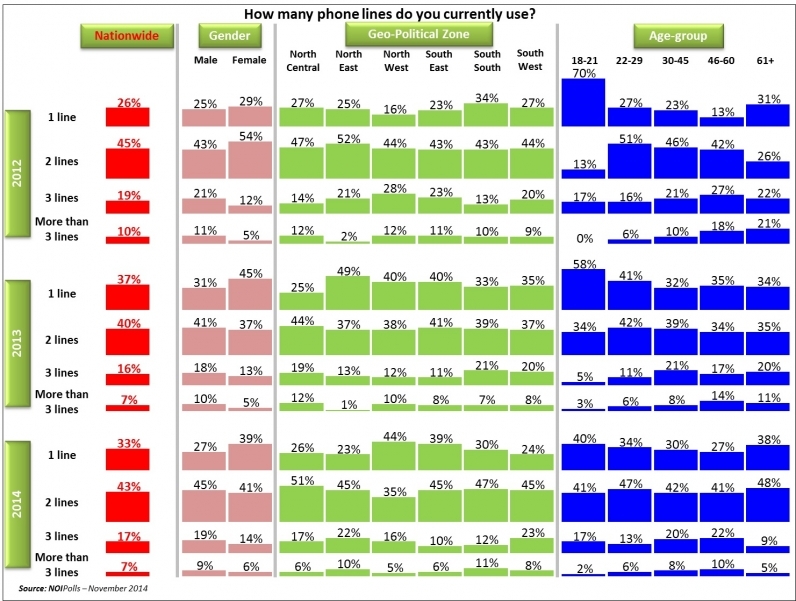 In addition, 33% of Nigerians use one line, 17% use 3 lines, while 7% confirmed they use more than 3 lines. A 3-year trend analysis on the usage of phone lines in Nigeria revealed a consistent trend of 2 phone line usage by Nigerians from 2012 to 2014, however there was a 5-point reduction in the proportion of Nigerians in this category from 2012 to 2013 and 3-points increase in 2014. More findings revealed that more residents from the North-East zone use more than 3 phone lines in 2014 compared with the past 2 years with a significant increase of 9-points from 2013(1%) to 2014 (10%). A view of the trend on phone usage across age-groups revealed that Nigerians within the age-group of 18-21 years have increasingly adapted the use of 2 phone lines over the years; from 2012 where it was lowest to 2014 (41%) with the highest record. This increase in this category of Nigerians has stimulated a drop in the use of 1 line by this age-group. On the other hand, respondents aged 61+ have continuously reduced the use of 3 or more lines to settle for the use of 1 to 2 lines from 2012 to 2014. Subsequently, with the aim of exploring the mobile network providers used by Nigerians, respondents were asked: Which network provider(s) do you currently use? Findings revealed that MTN is the highest used line as confirmed by the vast majority of respondents(91%); this is followed by Airtel (45%) and Etisalat (33%). While 28% of Nigerians use Glo, only 1% of Nigerians use Visafone. This finding validates the data of the Nigerian Communication Commission (NCC) which revealed the movement of Airtel Nigeria Limited up to the second place in terms of market share on the number of mobile subscribers on its network with MTN maintaining the first position. 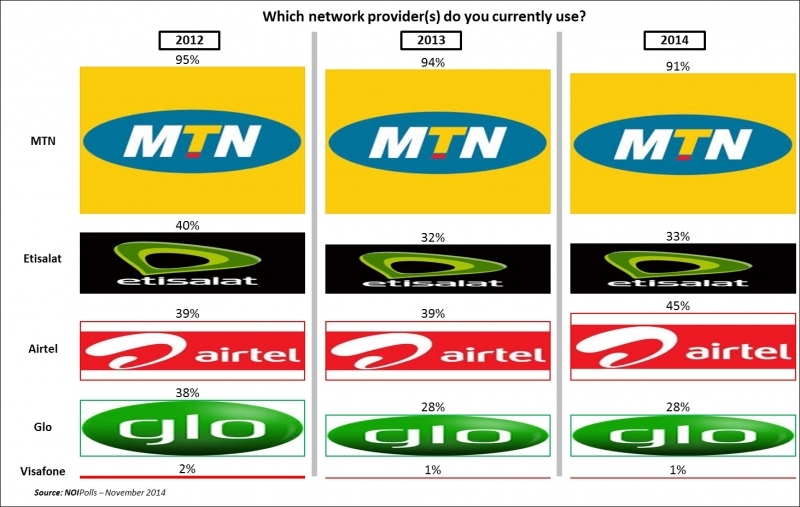 Trend analysis on the network providers used by Nigerians from 2012 to 2014 depicts a consistent decline in the proportion of Nigerians who subscribe to MTN from 2012 to 2014 with a total decline of 4-points within this period. According to the MTN group, this decline has been mainly due to 'regulatory restrictions' imposed by the telecoms watchdog and the growing spate of unrest by Boko Haram especially in the Northern part of Nigeria. While a significant 8-point decline in the proportion of Glo subscribers from 2012 (40%) to 2013 (32%) was seen, a further 4-point decline was seen this category of subscribers in 2014 (28%). The same applies to Etisalat with a 10-point decline from 2012 (38%) to 2013 (28%) although a 4-point increase was recorded in 2014 (33%). On the other hand, the proportion of Airtel subscribers which seemed steady from 2012 to 2013 at 39%, picked up by 6-points in 2014 (45%), thus, making it the only network that has seen a considerable growth in the proportion of its users. Respondents were also asked: Are you getting value for money from your main network provider? Overall, a higher proportion (64%) of mobile phone users believe they are getting value for money from their main network provider. This cuts across all age-groups and geo-political zones, however, respondents aged 18-21 years (69%) feel more strongly about this position compared with all other age-groups. On the contrary, (36%) of the respondents claimed they are not getting value for money from their main network provider. Trend analysis on the reception of value for money from main network providers reveals that a higher proportion of subscribers across all networks consistently confirmed the reception of value for money from 2012 to 2014; although, an increase was experienced in this category of subscribers who use MTN (9-Points) and Airtel (2-points) as their main lines in 2014 from 2013. Also, there was a significant 22-point decrease in the reception of value for money by subscribers who use Etisalat as their main line in 2014 from 2013. In order to determine how subscribers get value for money from their network provider, respondents who indicated they get value for money were asked: How are you getting value from money from your network provider? Recent findings revealed that most subscribers get value for money from their network provider through the ‘quality of network services’(27%), ‘bonus offers’ (25%) and ‘cheaper tariff’ (23%) among others. Comparing the results from 2012-2014, the number of subscribers who indicated 'quality network services' dropped by 19 points in 2013 and since then remained stable till 2014. Meanwhile, those who indicated ‘Bonus offer’ declined by 8-points in 2013 and then increased by 14-points in 2014. Similarly, the number of subscribers who indicated ‘cheaper tariff’dropped by 14-points in 2013 and further declined by 2 points in 2014. Consequently, respondents were asked: In your opinion, which network operator provides the best services in Nigeria? Findings revealed that MTN ranks highest for best services in Nigeria, followed by Airtel and Etisalat (68%, 17% and 11% respectively). The majority of subscribers who indicated MTN were within the ages 18-21 years, followed by adults within the ages 61 years and above (79% and 70% respectively). Comparing the results from 2012 to 2014, MTN improved in providing best services to its subscribers by 14 points in 2013 but declined by 5-points in 2014. On the other hand, Airtel decreased by 6-points in providing best services to its subscribers in 2013, nonetheless, it increased by 7-points in 2014. Likewise, Etisalat declined by 6-points in 2013 but increased by 3-points in 2014, While Glo decreased by 2-points in 2013 and further decreased by 4-points in 2014. Lastly, in order to ascertain the measures needed for the improvement of telecommunication services in Nigeria, respondents were asked: In your own opinion, what measure should be taken to improve the quality of telecommunication services in Nigeria? Most subscribers suggest the ‘reduction of tariff’ (30%) as a measure to improve the quality of telecommunication services. This was followed by ‘wider network coverage’ (22%) and‘improved network services’ (22%) of network providers. Across geo-political zones, the North-East (47%) had the highest number of subscribers who indicated the ‘reduction of tariff’. Likewise, the South-East (29%) and North-Central (30%) zone had the highest proportion of subscribers who indicated ‘wider network coverage’ and‘Improved network services’ respectively. In conclusion, the telecommunication poll revealed that Nigerians mostly use 2 phones lines, and trend analysis revealed that the usage of two lines has been consistent in Nigeria from 2012. An assessment of the mobile networks used by Nigerians revealed that Nigerians mostly use MTN, this has been consistent from 2012 to the present time, however there has been a consistent decline in the proportion of subscribers to this network within this period. This is followed by Airtel (45%); Etisalat (33%), Glo (28%) and Visafone (1%). In addition, the proportion of Airtel subscribers which seemed steady from 2012 to 2013 at (39%), picked up by 6-points in 2014 (45%), thus, making it the only network that has seen a considerable growth in the proportion of its users. More findings from the telecommunication poll revealed that most subscribers get value for money from their network provider through the ‘quality of network services’, ‘bonus offers’ and ‘cheaper tariff’ among others. Recent findings also revealed that MTN ranks highest for best services in Nigeria in 2014, followed by Airtel and Etisalat (68%, 17% and 11% respectively). In line with this, most subscribers suggest network providers reduce their tariffs, provide wider network coverage and improve their network services so as to improve the quality of telecommunication services in Nigeria.